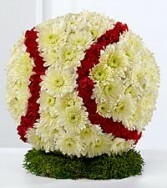 A symbolic tribute to baseball fan or player. Higher priced item is arranged on a baseball diamond of fresh greens. 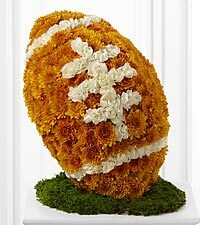 A symbolic tribute to the football player or fan. Larger priced item is designed on a "field" of fresh greens and painted lines. This pure white bouquet of Casa Blanca lilies makes an elegant statement as a perfect floral tribute, centerpiece or decorative arrangement. These lovely lilies also leave a soft fragrance in the air. Show loved ones that you care with fresh flowers from HIGHLAND FLOWERS. Show kindness and affection with this inspired arrangement from HIGHLAND FLOWERS. This timeless and touching tribute would make a lovely addition of freshness and color that is sure to be enjoyed and much appreciated. Arrangement includes: hot pink and peach roses, peach carnations and hypericum, accented with looping lily grass for unique visual interest. A sympathy arrangement is the perfect way to say what you need without saying anything at all. Flowers uplift spirits and remind us of happier occasions. 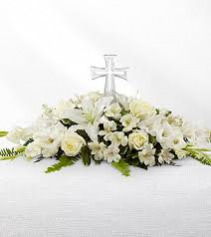 For sympathy arrangements or any type of funeral flowers in Vernon NJ, HIGHLAND FLOWERS is here for you.